The Spirit XE 350 elliptical trainer is an excellent choice for an all-around “total package” exercise machine, allowing you to run in place with a smooth, cushioned stride. Who would have thought getting in shape could be this easy? We like the design of this model which comes with a long 20” stride, articulated foot pedals to reduce ankle stress, and a large 30-lb flywheel that gives you a smooth, oval (elliptical) motion in your workouts. Not only is the Spirit XE 350 elliptical trainer fun to use but the fluid motion has a very low impact on your joints. And with a price of $1,399, it is also low impact on your wallet. Also included are upper body workout handlebars, dual direction path (forward/backward), Articulating footpads, adjustable footplates, and a telemetry belt. UPDATE: The Spirit XE 350 is an older model and is no longer available for sale. 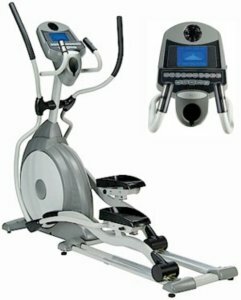 Check out the latest Spirit elliptical reviews here. Fitness experts are of a general consensus that the company seems to be under-pricing the Spirit XE 350 elliptical and other models), in order to gain a quick foothold in the market. Spirit Fitness is well-known for making excellent treadmills and they firmly believe that their elliptical trainers can compete with any competitor’s brand. Consumers continue to be impressed by the versatility of the Spirit XE 350. The upper body moving bars give you more bang for your workout and the dual direction glide offers a better overall workout by using the reverse direction to target the hamstrings and abdominal muscle groups. Even the elliptical trainer’s adjustable foot pad angle helps you work different muscles: the quadriceps will be worked harder at the highest angle, and at the lowest angle you can target the hammies and gluts better. We’ve had nothing but good experiences with Spirit elliptical trainers and we give the XE 350 a big two “thumbs up” for its smooth-as-butter, solid feel and its amazingly affordable price. In fact, the price is such an attractive feature that you may have trouble getting your hands on one of these beauties. At $1399 (and usually found for much less on the internet), we feel the Spirit XE 350 elliptical trainer offers excellent value.